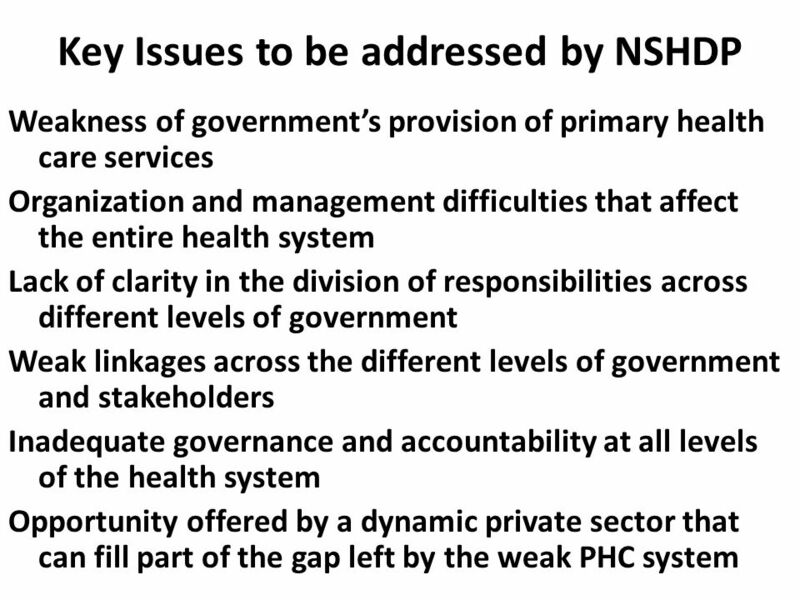 DEVELOPING STATE HEALTH PRIORITIES TO REFLECT NATIONAL HEALTH GOALS ~ Dr Tarry Asoka (Health Adviser) South-South Zonal Workshop on Putting Health High. 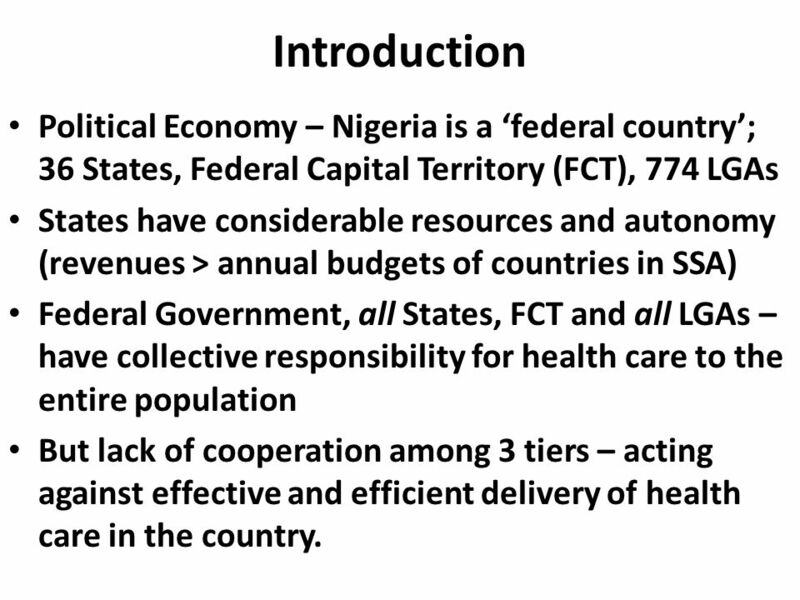 2 Introduction Political Economy – Nigeria is a ‘federal country’; 36 States, Federal Capital Territory (FCT), 774 LGAs States have considerable resources and autonomy (revenues > annual budgets of countries in SSA) Federal Government, all States, FCT and all LGAs – have collective responsibility for health care to the entire population But lack of cooperation among 3 tiers – acting against effective and efficient delivery of health care in the country. 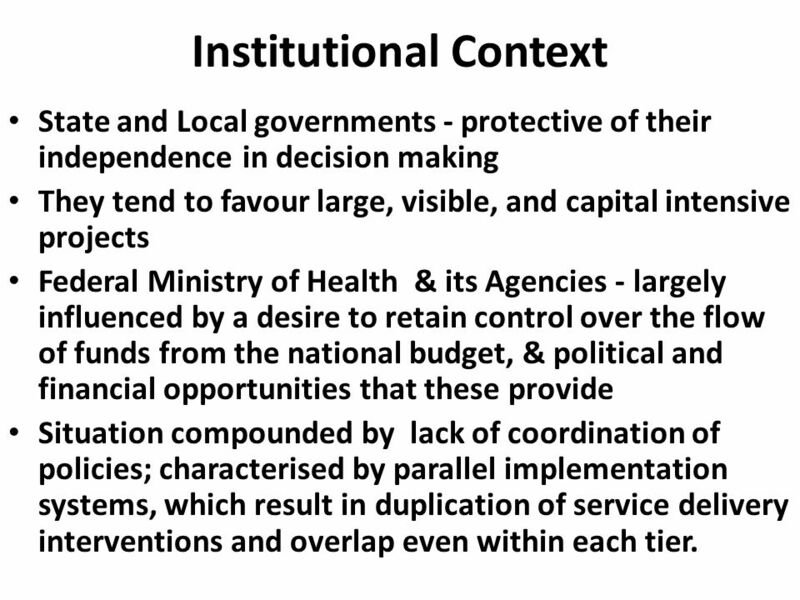 State and Local governments - protective of their independence in decision making They tend to favour large, visible, and capital intensive projects Federal Ministry of Health & its Agencies - largely influenced by a desire to retain control over the flow of funds from the national budget, & political and financial opportunities that these provide Situation compounded by lack of coordination of policies; characterised by parallel implementation systems, which result in duplication of service delivery interventions and overlap even within each tier. 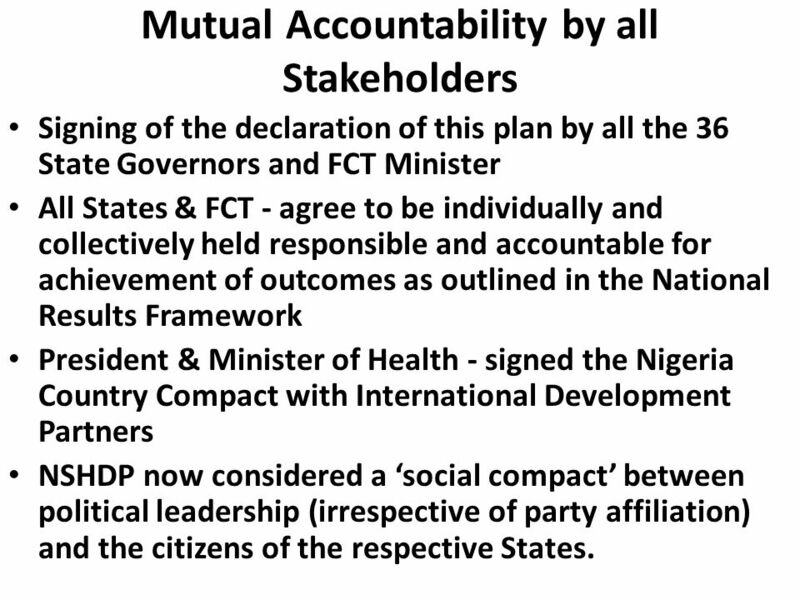 Signing of the declaration of this plan by all the 36 State Governors and FCT Minister All States & FCT - agree to be individually and collectively held responsible and accountable for achievement of outcomes as outlined in the National Results Framework President & Minister of Health - signed the Nigeria Country Compact with International Development Partners NSHDP now considered a ‘social compact’ between political leadership (irrespective of party affiliation) and the citizens of the respective States. 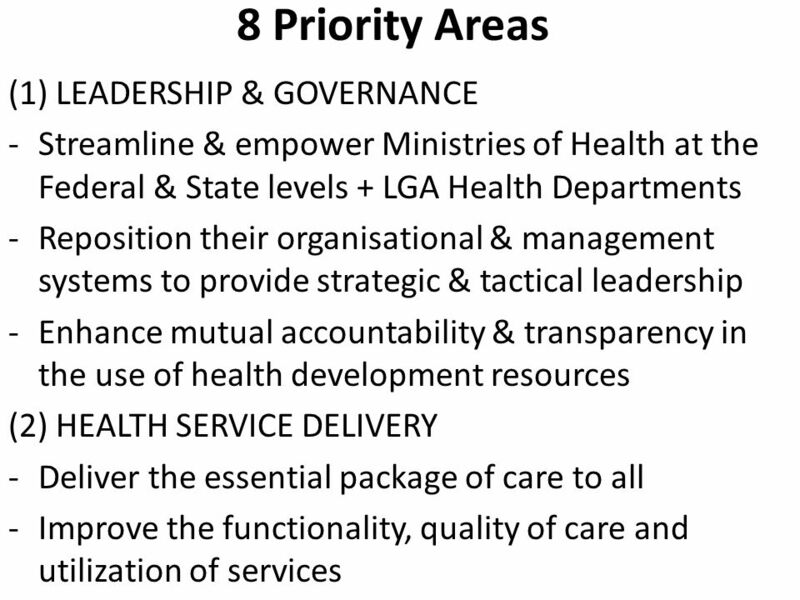 6 How Important is this? 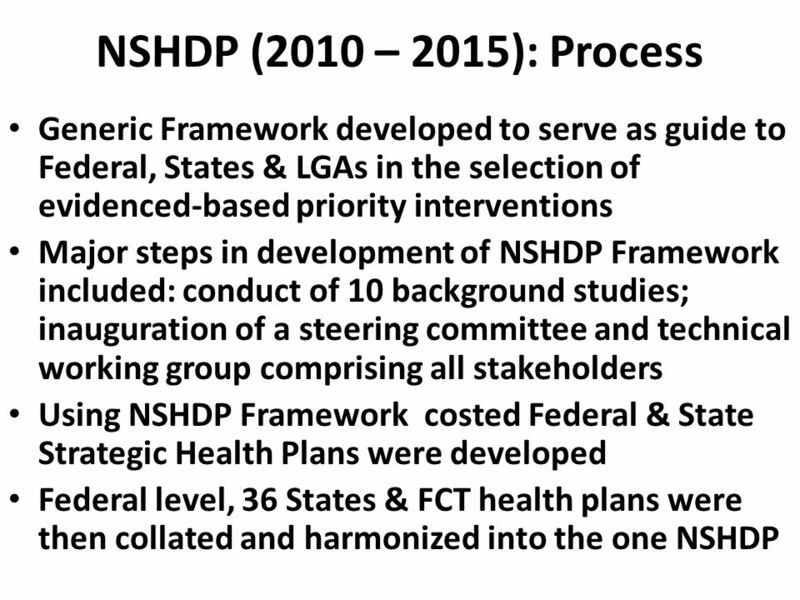 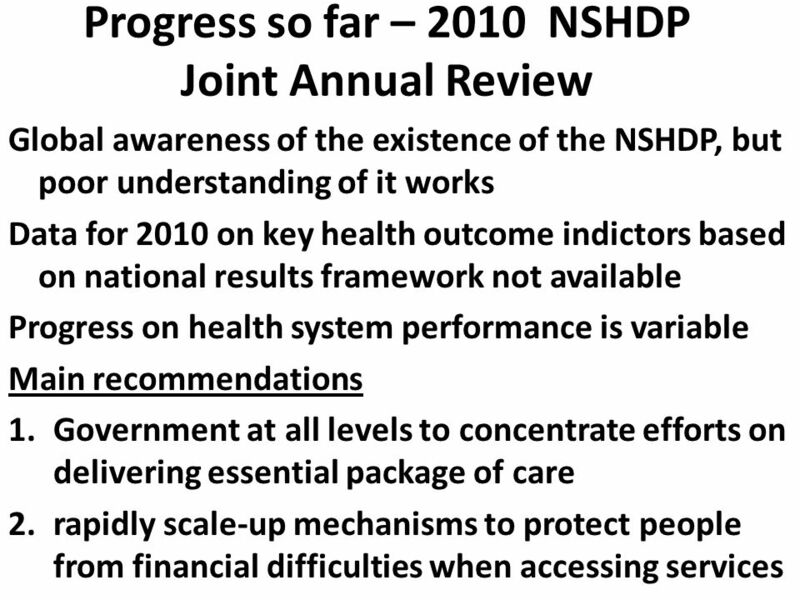 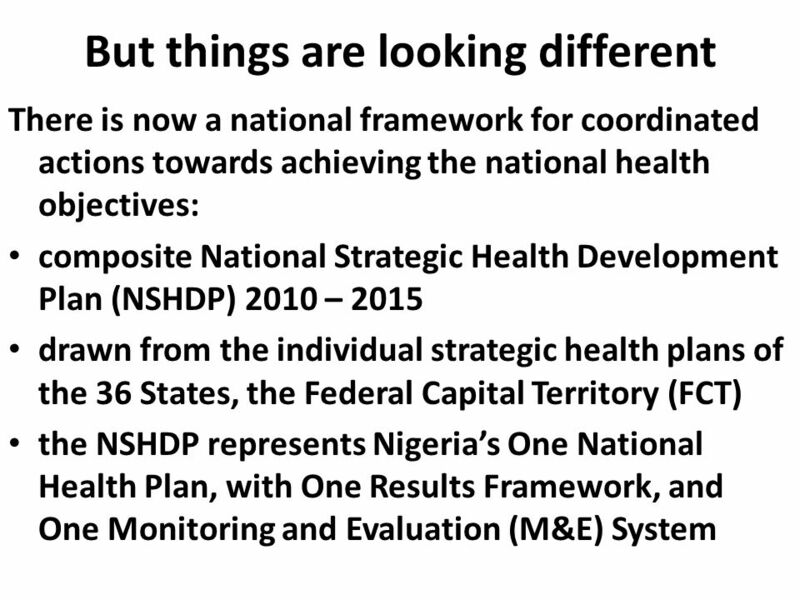 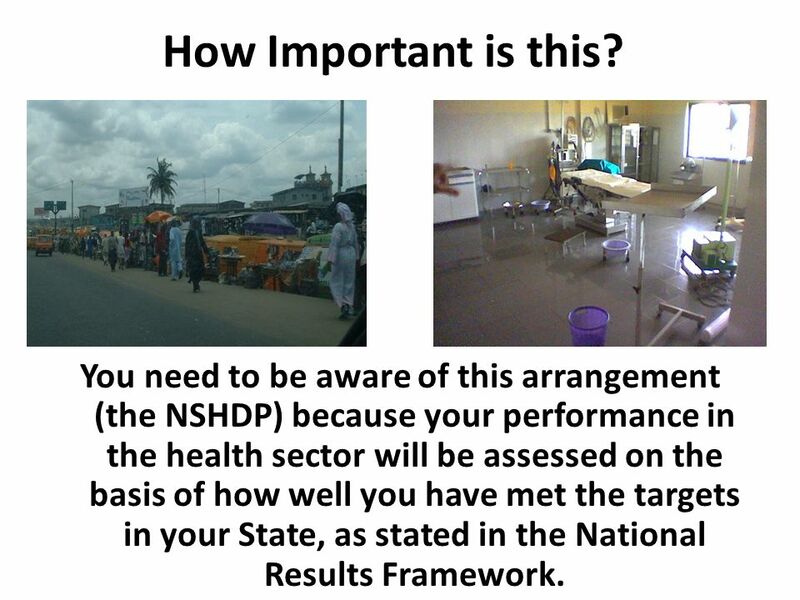 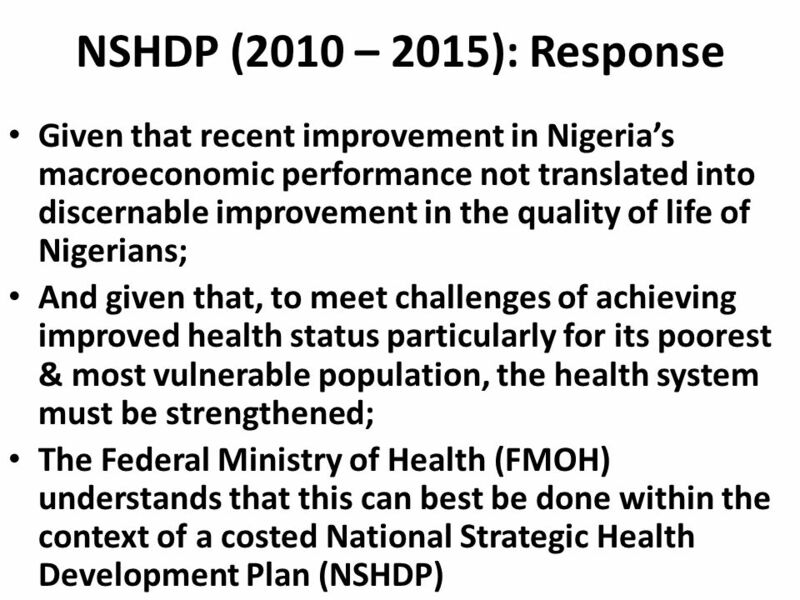 You need to be aware of this arrangement (the NSHDP) because your performance in the health sector will be assessed on the basis of how well you have met the targets in your State, as stated in the National Results Framework. 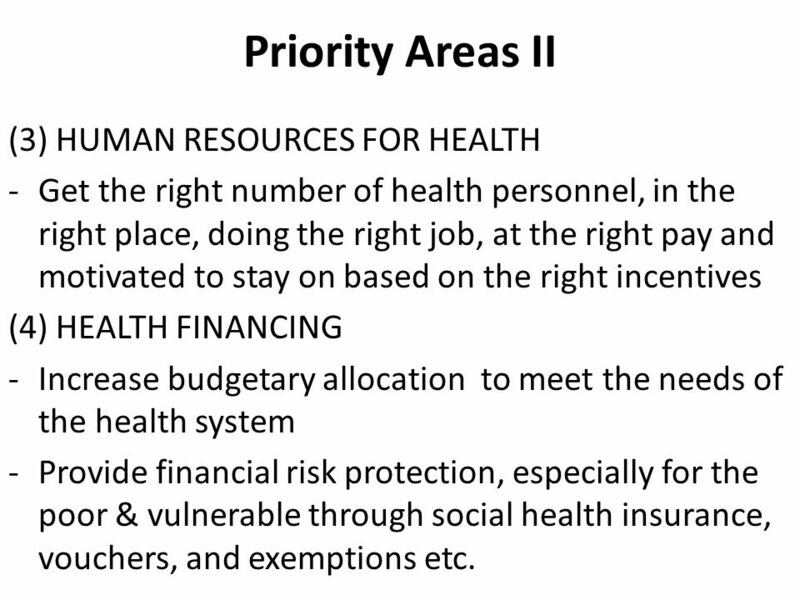 Get the right number of health personnel, in the right place, doing the right job, at the right pay and motivated to stay on based on the right incentives (4) HEALTH FINANCING Increase budgetary allocation to meet the needs of the health system Provide financial risk protection, especially for the poor & vulnerable through social health insurance, vouchers, and exemptions etc. 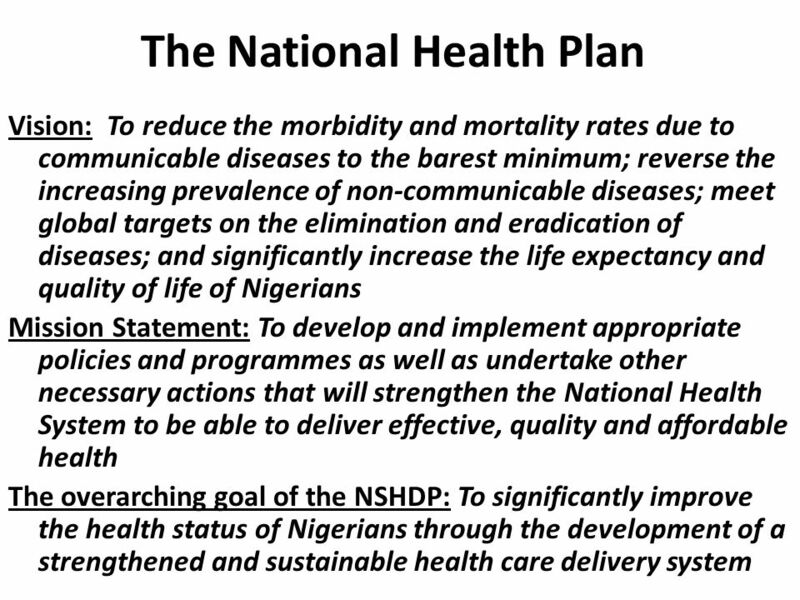 20 Conclusion The arena where real actions are required to turn around the dismal health indicators of the country is at the State level. 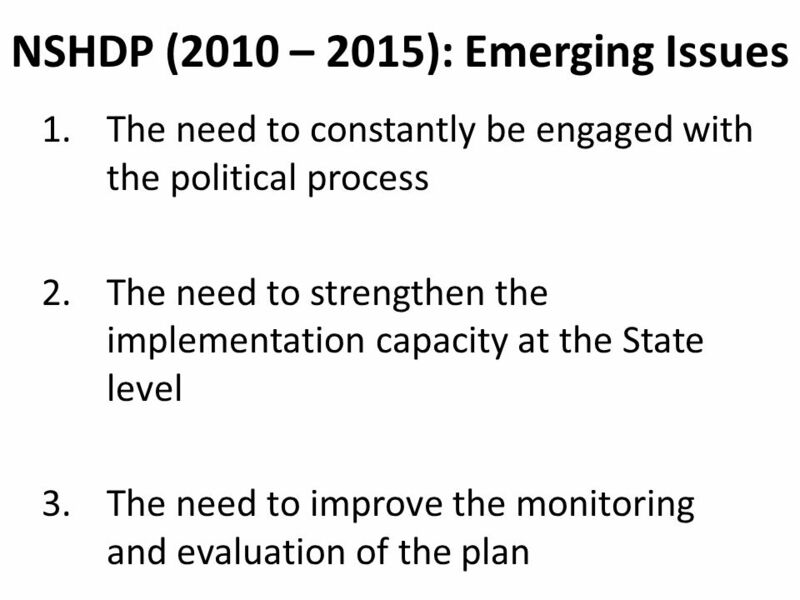 And with the current zeal being shown by citizens to participate more actively in the political process, it may no longer be business as usual. 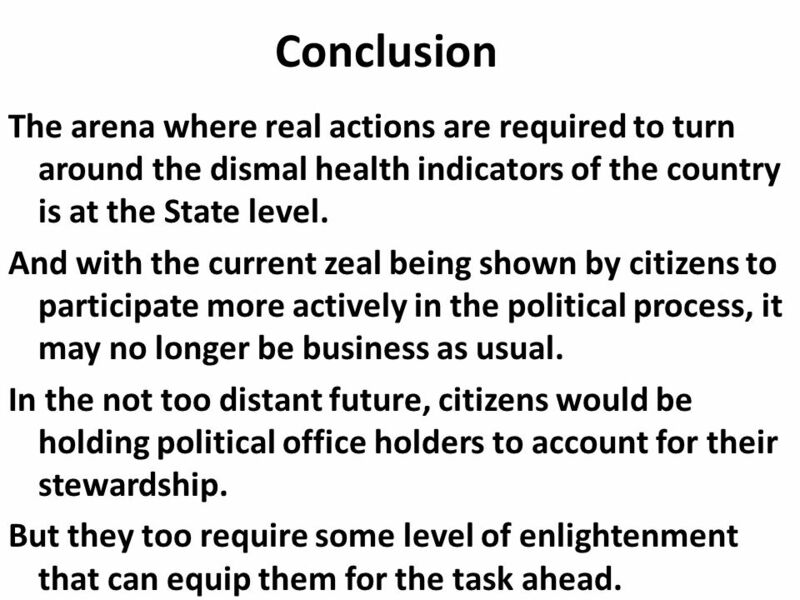 In the not too distant future, citizens would be holding political office holders to account for their stewardship. 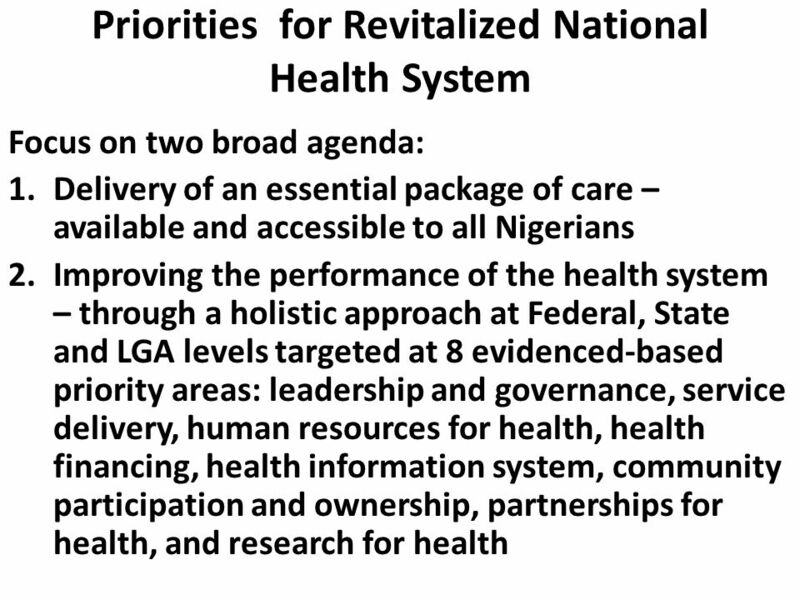 But they too require some level of enlightenment that can equip them for the task ahead. 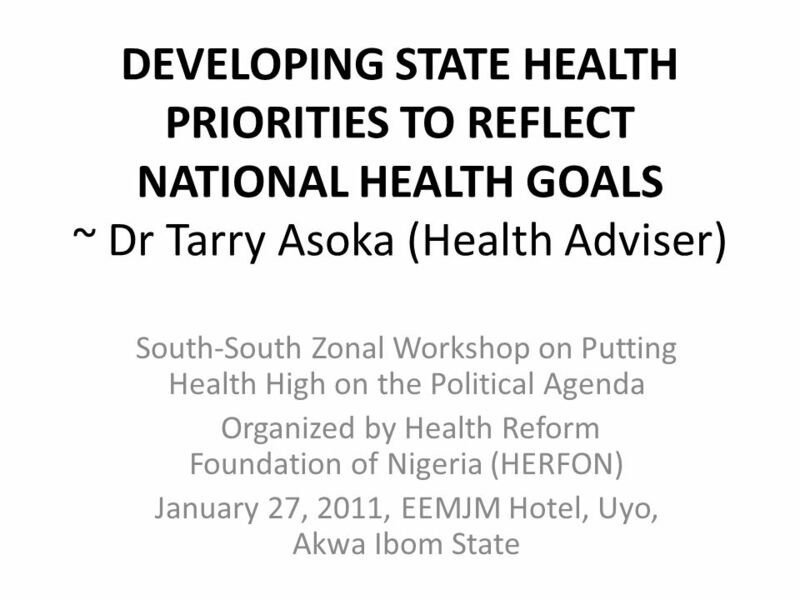 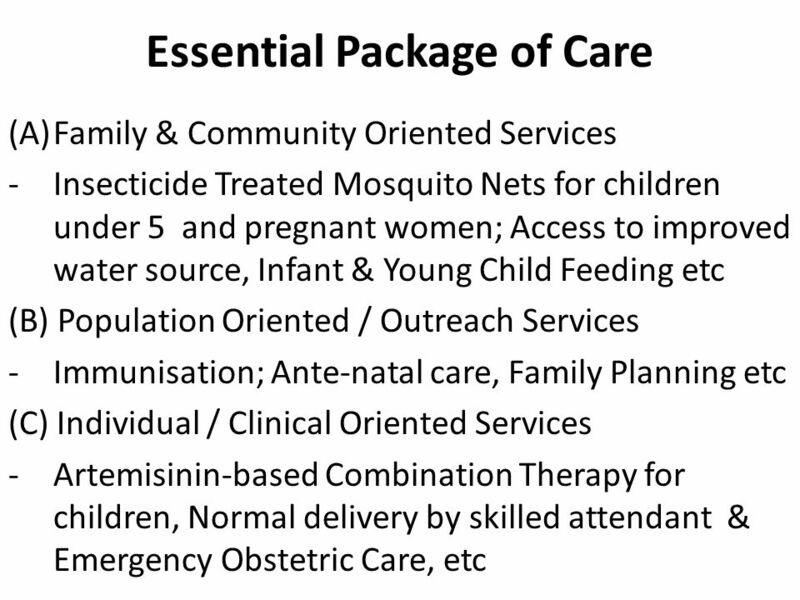 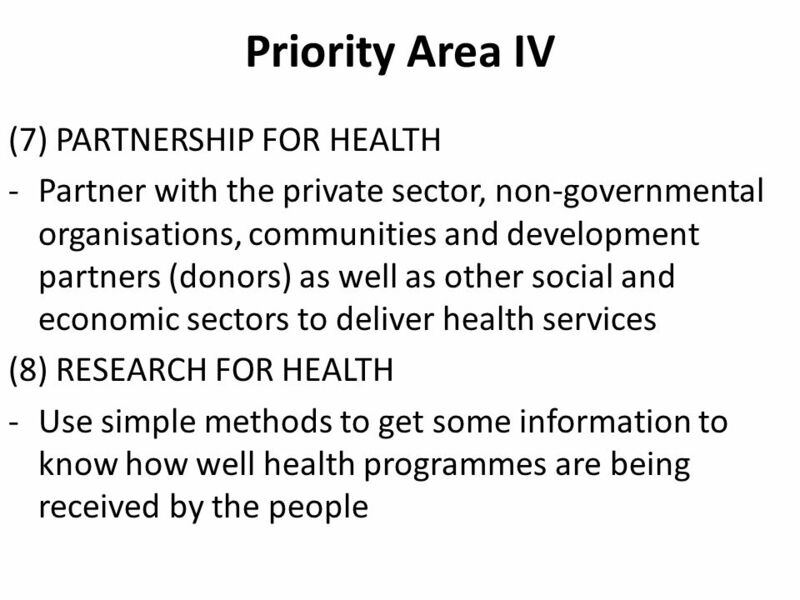 Download ppt "DEVELOPING STATE HEALTH PRIORITIES TO REFLECT NATIONAL HEALTH GOALS ~ Dr Tarry Asoka (Health Adviser) South-South Zonal Workshop on Putting Health High." 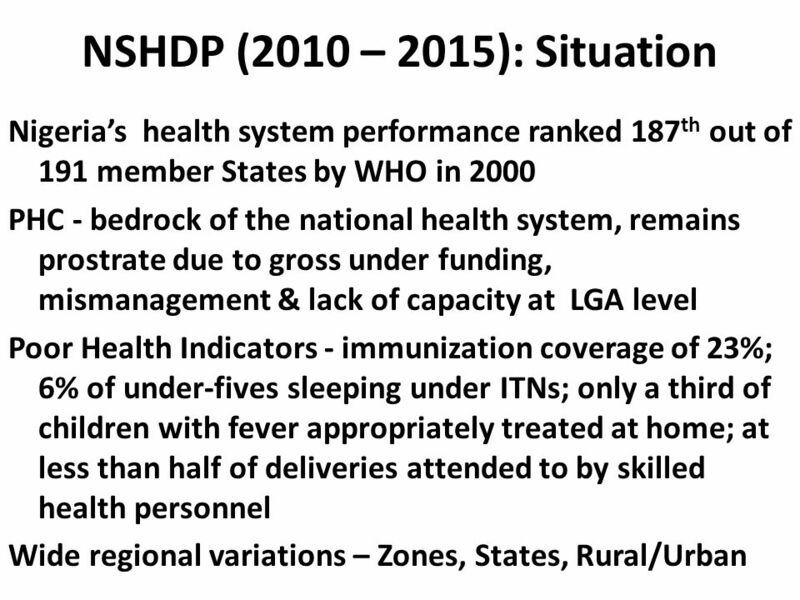 Presented at the ECOSOC 2012 Development Cooperation Forum 1 st High-level Symposium Bamako, Mali 5-6 May 2011 by Timothy Lubanga, Assistant Commissioner. 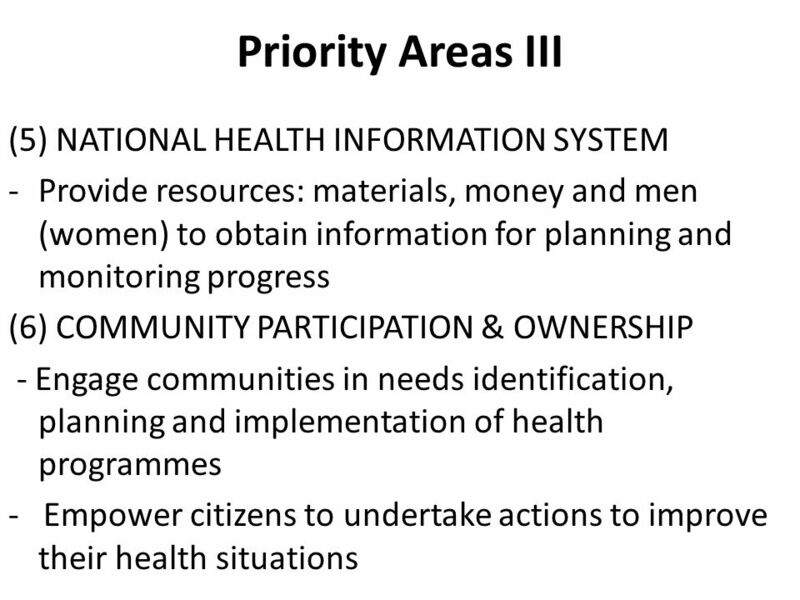 ITC-ILO/ACTRAV Course A1-05076 Trade Union Training on Occupational Safety, Health & HIV/AIDS (26/11 – 07/12/2012, Turin) Introduction to National Occupational.